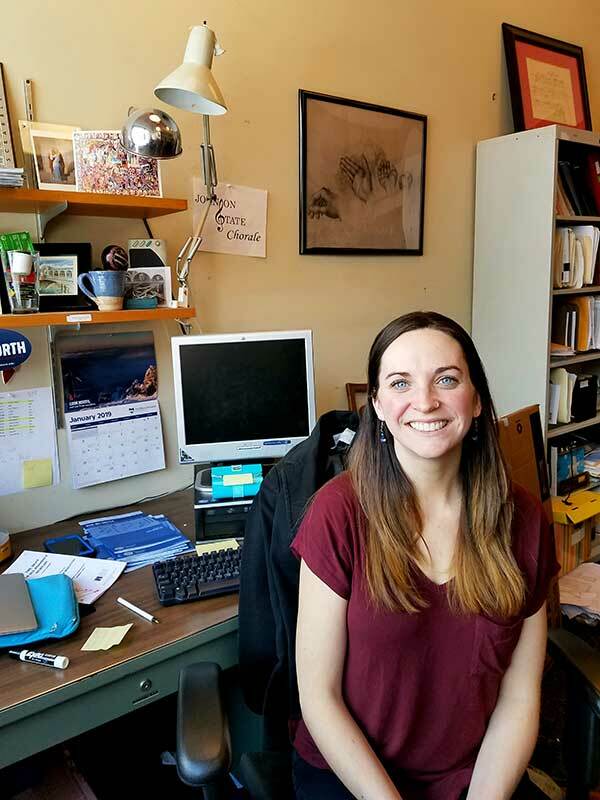 As many of the music department students are aware, Assistant Professor of Performing Arts Bethany Plissey has left this semester to go on sabbatical. In the meantime, Jessica Pierpont will be filling in. Pierpont grew up in Connecticut, where she spent nine years as part of a professional girls’ choir. During this time, she was first given the opportunity to conduct. She was in high school and notes she really enjoyed working with the girls in the choir on such a professional level. “So, working at a very professional level, or working at a very high caliber, is something I have always been really interested in doing. More so making art, is really something I’m drawn to,” she says. Having that experience really planted the seed for her future career. However, when she went to college, she started off in equestrian studies at Vermont Technical College. After a year of that, she realized she missed music, so she moved to Castleton University to study music there. At first she was a vocal major with a focus in music education but then switched to piano performance before graduating with a BA in general performance in 2014. After that she went back to Connecticut for an internship with the group that she had performed with as a kid. Continuing to build on a solid musical education platform, she went on to earn her master’s in conducting from the University of Arizona in 2016 and then decided to come back to Vermont. When she returned to Vermont, she began teaching elementary and middle school students for a brief stint, but realized that she wanted to pursue college teaching in a more professional setting. As far as what she wants to bring to the table during her time at NVU-Johnson, she says that while it’s important for directors to have a little bit of an ego, it’s also important to maintain an open mind when working with any new choir. This allows the choristers to benefit from the experience, while also helping the conductor better understand the group and gain experience with them. “As long as you keep a really fluid communication line between you, the accompanist and the choristers, and you think about how you can generate a good sound, and you always keep that in the back of your mind, that’s the most helpful,” she says. Pierpont is looking forward to working with the chorale groups this year, and particularly excited to work with them on their spring tour. She says she loves performances because she gets to hand everything over to the ensemble. “It’s an opportunity for a lot of things to happen and to kind of let that responsibility go into the hands of the -or mouths- of the choristers is a really overwhelmingly gratifying thing,” she says. Although Pierpont listens to everything especially new works, she enjoys rock and pop when she just wants an easy listen. As far as choral music, she loves anything from the Baroque period or early Renaissance, and when she’s teaching it, she admires and looks for inspiration from Marin Aslop, the director of the Baltimore Symphony Orchestra as well as John Eliot Gardiner.